The EpiPen is a potentially life-saving device for those with severe allergies or asthma. The problem is that it costs $600 in the US. For those with or without respiration woes, the EpiPen represents what’s wrong with drug manufacturing nationally, namely high prices and manufacturer monopolies. Mylan, maker of the EpiPen, raised the device’s price 300% in seven years from 2009 to 2016, mostly because it could. Now, a collective of doctors called Four Thieves Vinegar is offering a free online guide on how to make an “EpiPencil” for just $30—5% of the price Mylan charges for its patented pens. That’s a bargain but it’s also potentially dangerous for patients to engage in unregulated drug-making. The official EpiPen and the DIY EpiPencil both treat emergency allergic and asthmatic reactions by using a spring-loaded needle to inject the drug epinephrine in patients with respiratory emergencies. Epinephrine is a synthetic form of the hormone adrenaline, which can open the airways and restore breath. 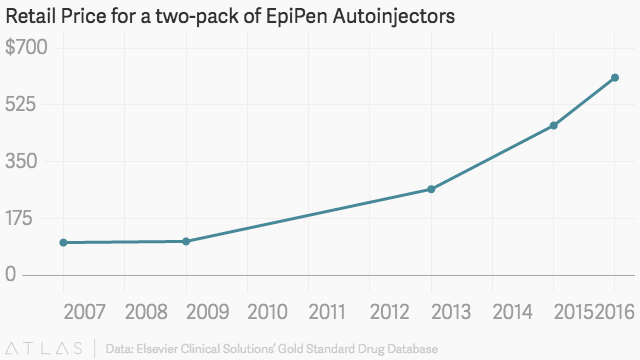 In 2007, an EpiPen cost $100. By 2016 they sold for $600 and public outcry against Mylan grew deafening. In August 2016, the company responded to criticism by offering a generic version of the EpiPen for $300. This cost-cutting concession by the manufacturer only confirmed what everyone suspected: EpiPens can be made for much less than Mylan was charging. When, on Sept. 19, the medical collective released its pharma-hack that suspicion was confirmed as fact. In a five-minute YouTube video with links to added instructions, Michael Laufer of the Four Thieves Vinegar collective explains how consumers can make their own EpiPencils. With this act, the collective essentially declared class war on legal drug lords, offering a public workaround for those who need the patented products. Epinephrine itself requires a prescription, though, and the collective isn’t telling people where to get the drugs, which highlights some of the issues raised by the DIY medication. The reason any drug is prescribed is to ensure patient safety and adequate dosages. Drugs are closely regulated because they can be dangerous when administered incorrectly, or in the wrong amounts, or to someone who is allergic, or simply if given to someone who is not in need of treatment. That’s why there are those who say the collective’s rogue approach to manufacturing medicine is dangerous—and a throwback to medicine’s bad old days when there was no regulation.